Before Prince put Minneapolis on the national music map with Purple Rain, and before the Replacements broke away from Twin/Tone Records to experience what a major label had to offer, the Minneapolis music scene was small, intimate, and building to explode. In Complicated Fun: The Birth of Minneapolis Punk and Indie Rock, 1974–1984, Cyn Collins documents space and time by exploring the memories of the misfits who were inspired by what they were hearing from England, Detroit, and New York City—and what they did to shape early punk and indie rock into something unique and different for Minneapolis. While crafting Complicated Fun, Collins found the structure for the book built around the city’s lack of organization and facilities to support new and original music, and how the community came together centered around a few key components in the late 1970s: Oar Folkjokeopus record store (located where Treehouse Records is today), Jay’s Longhorn bar, and the creation of Twin/Tone Records. “Something that captivated me was the fact there wasn’t really any place to play,” Collins told me. “The scene was kind of emerging from garage rock, and mainstream music, and cover bands. I thought it was interesting how these musicians had a desire to do something different. She noted how the early Minneapolis punk and indie rockers had to resort to playing unconventional venues, like high-school gymnasiums and ballrooms. “I learned that things were much more difficult than I realized in terms of getting gigs and gaining momentum and popularity,” Collins said. 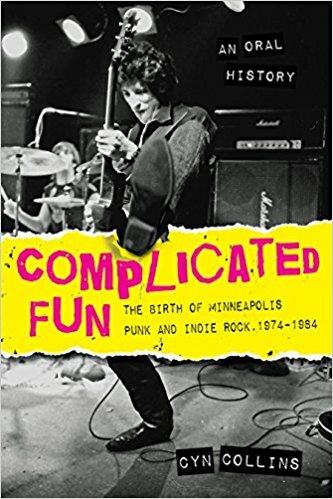 In addition to Suicide Commandos, Flamingo, and the support apparatus of Oar Folk, Jay’s Longhorn, and Twin/Tone, Collins’s book chronicles many other bands and vital components that are rooted in Minneapolis’s punk and indie-rock origin story. From the Hypstrz, the Suburbs, NNB, and the Mighty Mofos to the opening of First Avenue’s 7th St. Entry, Collins’s text—with the help of 80 black-and-white photos and illustrations—paints a vivid picture of what the time was like for everyone involved.